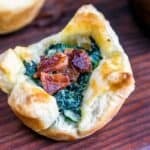 These easy Spinach Puff Pastry appetizers with bacon are a delicious golden puff pastry filled with cheesy creamed spinach and plenty of bacon. It is a simple buffet menu idea for holiday parties and would be a great addition to your Easy Football Food menu for game day! I host a lot of big holiday parties and one of the issues I always have is how to fit everything on the table without it feeling overly crowded. My solution is to serve the food buffet-style. That way everyone can fill their plates with all sorts of goodies like Garlic Roast Beef and Fig and Pancetta Stuffing without having to pass big heavy, and often hot, plates around a large table. Personally, when I think of buffet menu ideas I go straight to finger foods, and bite-sized appetizers. Most of us don’t have room to sit a party of 20+ people down at a table, so a buffet table full of simple finger foods like Mini Lasagna Rolls, Baked Crab Bites, and Spinach Puff Pastry appetizers means guests can fill their plates and easily eat without the need for a table. These small bites are also so much easier to prepare ahead of time and they really help to cut down on preparation on the night of your holiday party. You can prep this recipe for Spinach Puff Pastry ahead of time and assemble and bake right before the party. The puff pastry is cut into squares and pressed into the cups of a muffin pan. 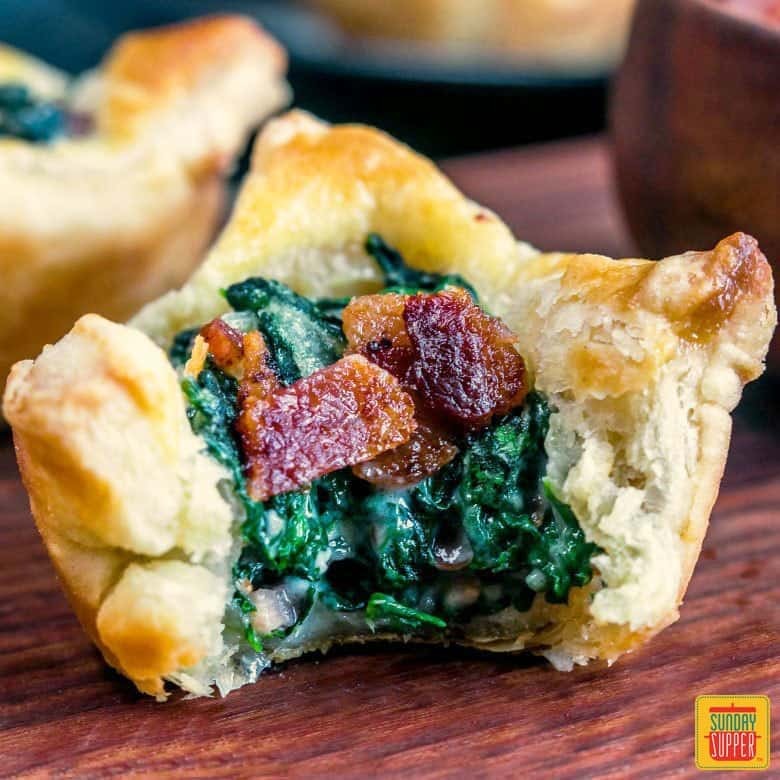 Each pastry square is filled with a cheesy, bacon-y creamed spinach and brushed with an egg wash. Then it is placed in the oven where it bakes for about 15 minutes, or until the puff pastry is golden brown. Garnish with a little bacon and serve! They are going to disappear off the buffet table within minutes! Thaw the puff pastry dough, slightly, until it is manageable. Use a pizza cutter to cut the puff pastry sheet into 9 squares quickly and easily. Brush the puff pastry with egg wash to help it brown nicely. Make the creamed spinach filling a day ahead of time and warm slightly before filling the puff pastries. Squeeze excess liquid from the thawed spinach until it is as dry as possible. In a skillet over medium heat melt butter, then add shallots and garlic and cook for 2-3 minutes until shallots become translucent. Sprinkle flour into skillet whisking for 1-2 minutes until flour lightly browns. Slowly add the heavy cream or milk, whisking continuously until the sauce begins to thicken, 3-5 minutes. Stir in white cheddar cheese and Parmesan cheese. Dice up 4 of the bacon strips and add to the cheese sauce. Stir until the cheese has melted. Add spinach to the mixture and stir to combine. Remove from heat while you prepare the puff pastry. On a lightly floured surface, unfold thawed puff pastry. Roll each sheet into a 12-in. square. Cut each pastry sheet into nine squares. Place in greased muffin cups, pressing gently onto bottoms and up sides, allowing corners to point up. 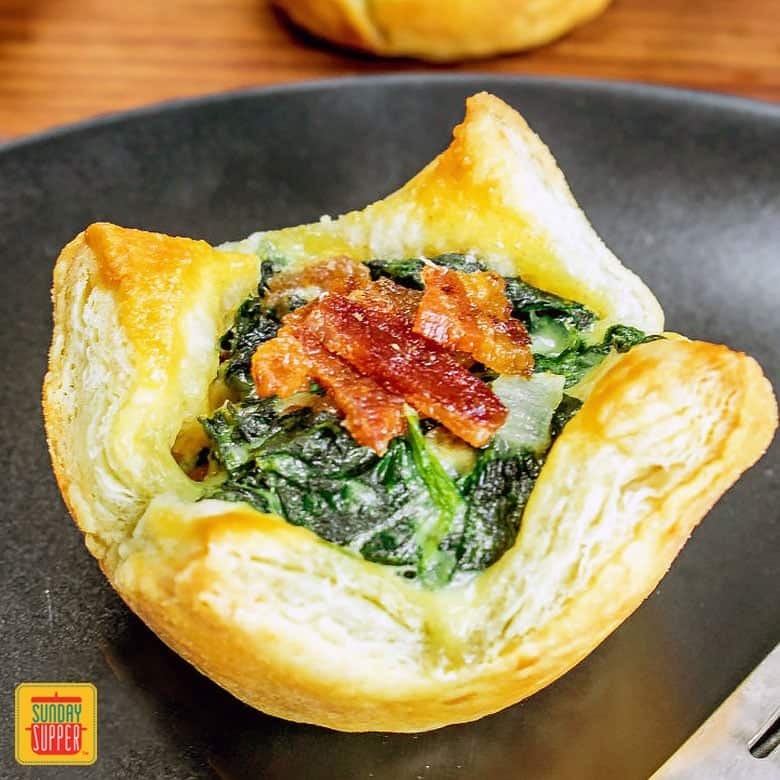 Fill each puff pastry cup with about 2 tablespoons of creamed spinach. In a small bowl mix together the egg and water to make an egg wash.
Brush egg wash over the puff pastry then place in the oven and bake for 15-18 minutes or until puff pastry is golden brown.